RECEIVING: Cheshire — Dan Sweeney, 7-58; Brian Havlicek, 7-42; Ryan Connolly, 4-53; Aaron Zomback, 3-37; Dan Reynolds, 1­11; Brian DeBisschop, 1-10; Glastonbury — John Pinone 3-72; Sean McQuillan, 2-9; Ryan McCarthy 1-6. RUSHING – Newington: Spencer Parker 14-86, Malik Golden 6-10, Jon Riddick 5-10, Jimmy Dombrow 4-49, Anthony Szwez 4-18, Shane Leupold 1-minus 14, Harrison Scully 2-3. Masuk: Nico Guerrera 14-114, Chris Cosmedy 9-51, Alex Trump 7-94, Bobby Baker 2-7, Joe Haughton 3-7, Parker Dance 3-minus 6, Javier Mercado 1-29. RECEIVING: Brookfield -- Scott Benzing 3-20; Trevor Treibt 2-3; Travis Treibt 1-27; Mike Palicz 1-9; Matt Snyder 2-14; Ledyard -- Fred Hewett 4-45; Sam Saccomano 5-118; Chris Blomstedt 1-minus 3; Richard Roselle 2-25. RECEIVING: Seymour — Searles 5-77; Osiecki 1-34; Bobby Anastasio 4-63; Dave Gallo 5-42. New London – Singleton 6-83; Dance 2-38; Craig Dysart 2-8. NEW BRITAIN, Dec. 6 -- Jordan Brown rushed for 208 yards and 3 TDs, and tight end/linebacker John Pinone had a big game on both sides of the ball to lead top-seeded Glastonbury over No. 3 Cheshire 28-14 in the Class LL championship game at Veterans Stadium before 7,000 fans. 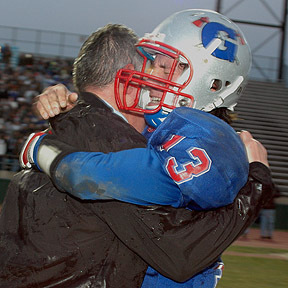 The state title was Glastonbury's first since 1989 and completes an undefeated season for the Tomahawks (13-0). Cheshire, making its first finals appearance since 1997, finished at 10-3. All the scoring came in the first half. Brown and Cheshire quarterback Billy Ragone exchanged touchdown runs -- Brown from 63 and 19 yards; Ragone twice from 2 -- before Glastonbury opened up a 28-14 lead in the final five minutes of the second quarter. A 38-yard completion from Erich Pfeffer to Pinone set up a 1-yard score from Brown with 5:06 left in the second quarter. Pfeffer ran for a key first down on fourth-and-1 at the Cheshire 28 with two minutes left. That set up a 15-yard scoring pass from Pfeffer to Pinone over the middle with 32 seconds left. Overall, Pfeffer was 7-for-11 for 92 yards. "I'm so happy for the kids. They did a super job," Glastonbury coach Peter Pfeffer said. "13-0 is a great accomplishment. We're so happy to be where we are and finish up the way we did. We won't forget this." Ragone, after sustaining a thigh bruise on Cheshire's opening scoring drive, was limited to throwing the ball. He was 23-for-40 for 218 yards, but threw two interceptions and also lost a fumble. 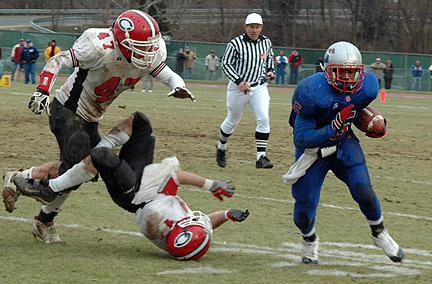 The fumble came after Cheshire had driven to the Glastonbury 34 midway through the fourth quarter, ending Cheshire's best bid of the second half, when both defenses dominated. "He's a big part of their offense. I know we going to contain him the best we could. He threw the ball well," Peter Pfeffer said. Pinone and Erich Pfeffer had the interceptions for Glastonbury. Pinone's came in Cheshire territory with the score tied 7-7 in the first quarter, setting up Brown's second TD. WATERBURY, Dec. 6 -- Nick Cacace punched in a 29-yard field goal with 1:47 left in the game, lifting Brookfield to its first state championship since 1995. Cacace, who missed an extra point earlier in the game, had his kick tipped but it had enough power to get through. Trevor Treibt, the game's Most Valuable Player, led the Bobcats (12-1) to their second state title and first in 13 years with 93 all-purpose yards and a touchdown. The senior captain also came up with two interceptions, including one with 53 seconds left in the game after defending champion Ledyard drove the ball to Brookfield 28. The Bobcat defense, which held the Colonels (10-3) scoreless after the first quarter, came up with three interceptions off Ledyard quarterback J.J. Jablonski, helping Brookfield rally from a 14-0 first-quarter deficit. Barquis Haley led the Colonel offense with 124 yards rushing 19 carries and Sam Saccomano had 118 yards and a touchdown on five catches. WEST HAVEN, Dec. 6 – Cromwell won their first-ever state championship with an improbable 14-12 victory over heavily-favored Ansonia in the Class S championship game. The Chargers, looking to win a third straight Class S title, jumped out to an early 12-0 in the first quarter but couldn’t put the Panthers away. Cromwell blocked an extra point and stopped a two-point conversion run. Cromwell cut the lead to five on Michael Zimmitti’s six-yard TD run and Kevin Molde’s extra point with 6:36 left in the second quarter. Cromwell took the lead in the third quarter when QB Bobby Jordan (15-125) scored from the one with 7:30 left in the quarter. 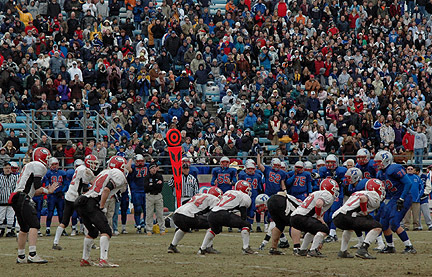 Molde’s extra point gave Cromwell the two-point lead. Late in the fourth quarter, Cromwell converted on a key third-and-11 from their own 35 when Jordan found Tyshaun Prude on a screen pass for a 33-yard gain to the Ansonia 33 with 2:28 remaining to keep the ball and eventually run out the clock. WEST HAVEN -- Richie Vitale ran 42 times for 303 yards and two touchdowns to lead the Whalers to its first state championship under coach Jack Cochran with a 27-18 win over Seymour in the Class SS final at Strong Stadium. QB Casey Cochran completed 10 of 15 passes for 148 yards and two touchdowns with an interception for New London (12-1) and Nick Singleton added six catches for 101 yards and two touchdowns. Teammates Bryce Childs, Dan Hill and Micah Bowe each had a sack. Seymour's Mike Osiecki, the state's Gatorade Football Player of the Year, was held to 40 yards and a touchdown on 15 carries. Connor Shugrue was 14 of 26 for 200 yards with two touchdowns and an interception for the Wildcats (11-2). Taylor Searles added five catches for 70 yards and two touchdowns. The game was the last for Seymour coach Paul Sponheimer, who is retiring after 29 years. TRUMBULL, Dec. 6 – The bus carrying the players to the Class MM championship game broke down delaying the start of the game for nearly two hours. But it didn’t slow down undefeated New Canaan (13-0), which won its third straight championship with a 26-7 win over Darien. About 10 days ago, the Rams beat Darien, 28-20 to win the FCIAC championship. Game MVP Nate Quinn (17-32, 198 yards) threw 2 TD passes to Cody Newtown (19, 4 yards) and ran for a 2-yard TD to lead the Rams. He rushed for 97 yards on 18 carries. It’s the first undefeated season under coach Lou Marinelli. The Rams have won five titles under Marinelli. Matt Gencarelli led the Blue Wave (11-2) with 88 yards on 10 carries. WEST HAVEN, Dec. 6 -- Masuk (12-1) amassed 557 yards of total offense and scored 8 TDs to crush Newington 56-13. Alex Trump (8-100) ran for 2 TDs while Niko Guererra (12-119) scored a TD. QB Bob Baker (9-13-0, 252) threw 4 TD passes. Masuk's defense, led by Mike Costello's two sacks, forced three turnovers and sacked Newington QB Spencer Parker three times. Chris Cosmedy and Bobby Ambrose had interceptions. R.J. Perimenis had a fumble recovery. Newington (10-3), which was making its first championship appearance since 1991, had 244 yards of total offense. Parker led Newington with 87 yards on 14 carries and completed 3 of 10 passes for 71 yards and a touchdown. Masuk, which led 29-7 at halftime, won its first title since 1998.
n Top photo, Glastonbury coach Peter Pfeffer hugs his son, QB Erich Preffer. Above, Glastonbury's Jordan Brown gets outside to score the second of his 2 TDs. n Over 7,000 fans filled Willow Brook Park in New Britain to see Cheshire battle New Britain for the Class LL championship.